Two downlink antennas that are the fastest of their kind to operate in space are being integrated into the protected communications payload built by Northrop Grumman Corporation for the fourth Advanced Extremely High Frequency (AEHF) satellite. Artistic rendition: AEHF satellite on orbit. Image courtesy of Lockheed Martin. The company delivered the Super High Frequency Array Unit (SAU), as the antennas are called, in early March to AEHF system prime contractor, Lockheed Martin, in Sunnyvale. California. 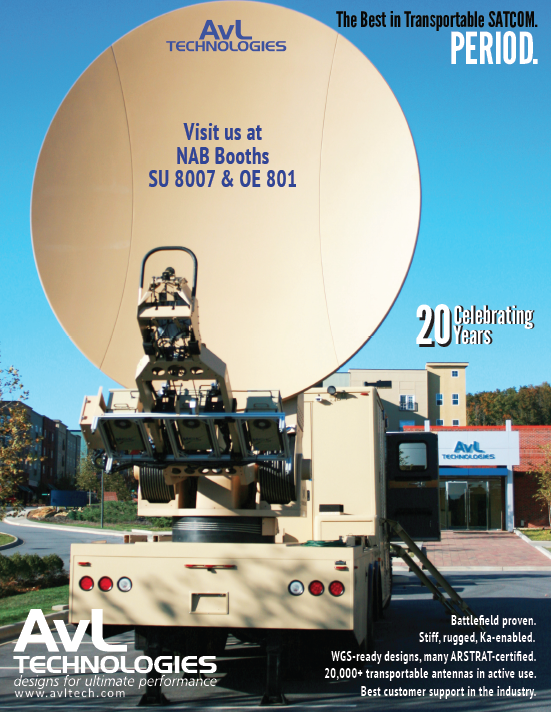 These high-speed downlink phased array antennas, the first to operate at 20 GHz in space, provide assured point-to-point connectivity using electronically steerable beams that reach military users at fixed-site and mobile terminals. Under a hybrid integration plan, Lockheed Martin is now integrating the satellite bus unit within the system module while a team from Northrop Grumman simultaneously completes the remaining payload integration. Northrop Grumman produces phased array antennas, which are a new technology developed specifically for AEHF satellites. High-speed downlink phased array antennas are the first of their kind to operate at 20GHz in space. High-speed uplink phased array antennas operating at 40GHz provide direct radio frequency beams electronically rather than by moving reflectors mechanically. Advanced EHF anti-jam payloads communicate via super high frequency downlinks, transmitting in the 20.2 to 21.2GHz frequency band, and EHF uplinks, which also are the first to operate at 40GHz in space. “This allows one array to do the job of many reflectors, giving the flexibility to point-on-demand in fractions of a second to hundreds of coverage areas, greatly improving access and automatically countering signal jamming by adversaries,” said Stuart Linsky, vice president, Communication Programs, Northrop Grumman Aerospace Systems. This agility and flexibility of the beams formed by the phased arrays are critical to providing coverage to the dispersed tactical and strategic users on the AEHF system. The high-speed phased arrays are used to form multiple beam types concurrently including high gain Earth coverage anywhere in the satellite field of view, super high gain Earth coverage to up to 160 locations, and up to 24 medium resolution coverage area spot beams. 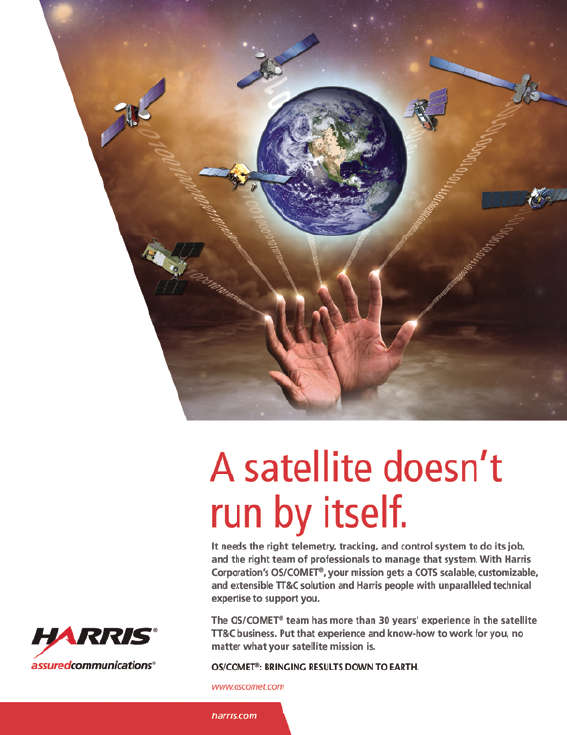 The next generation of protected military satellite communications satellites, AEHF provides vastly improved global, survivable, highly secure, protected communications for strategic command and tactical warfighters operating on ground, sea and air platforms. The system also serves international partners including Canada, the Netherlands and the United Kingdom. With the more compact phased array, AEHF can process greater amounts of information. It will deliver 10 times greater total capacity and channel data rates six times higher than that of Milstar II communications satellites. AEHF is the successor to the Milstar system. The SAU was built by Northrop Grumman’s Antenna Products Center, which also provides EHF Uplink Phased Array unit, jam-resistant nulling antenna subsystems, crosslink antennas and steerable spot beam antennas for the AEHF Payload. Previous ahead-of-schedule deliveries included the uplink phased array (UPA) high-efficiency converter that operates the payload’s UPAs. Commercial application specific integrated circuits were also delivered on time, along with hardware consisting of electromechanical switches, passive microwave filters and beam select switch assemblies. Watchkeeper is the first UAS to be awarded a full Release To Service (RTS), and is the only UAS of its type allowed to fly in UK airspace. The RTS follows the MOD’s rigorous safety and airworthiness reviews to ensure the system can be operated safely by the British Army. It will support British Army operations by allowing training on the system in the UK. Watchkeeper is a high-performance, multi-sensor, all-weather UAS that can remain airborne for more than 16 hours in a single mission. The tactical UAS will be deployed by the British Army for life-saving surveillance and intelligence capabilities in support of military operations and is unarmed. Crucially, Watchkeeper is certified to the same safety standard as manned aircraft. The RTS moves the Watchkeeper program from the testing and evaluation phase—previously undertaken by Thales operators in the approved test airspace near Parc Aberporth, West Wales—to full flight training for British Army operators. It follows the announcement (24 February) that the British Army will begin training flights from Boscombe Down, Wiltshire. The RTS will allow army crews to fly sorties in segregated airspace, integrating with the military exercises taking place on Salisbury Plain. Little was selected by a panel of experts from across the aerospace and defense industry. He will be presented the award at the National Space Club’s Goddard Memorial Dinner on March 7 in our nation’s capital. The annual Dr. Robert H. Goddard Memorial Dinner is the major event of the Washington space calendar, first celebrated in 1958. 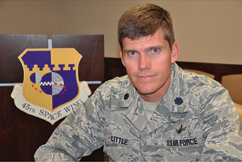 A 1997 graduate from the University of Florida, and a Central Florida native, Little was commissioned through the Air Force ROTC program. He never thought his career path would reach to the stars. He didn’t pick Space as a career; Space picked him. “As an environmental engineering major at UF, I fully expected an Air Force assignment in the Civil Engineer arena. But that didn’t happen,” he said. “Only one of us went the CE route and the rest were commissioned as 62Es [Developmental Engineer]. “In addition, I was selected for the Operational Space and Missile Tour program. That program put me in an operational space and missile tour for my first assignment and then sent me to an acquisition tour second. “So, I went to Undergraduate Space and Missile Training at Vandenberg AFB and on to the 3rd Space Ops Squadron as a satellite vehicle operator,” he added. He has been a member of the 45th Space Wing Sharks since 2011. According to Col. Matthew Skeen, commander, 45th Launch Group, Little successfully led his squadron as they integrated and launched six Department of Defense satellites, provided Air Force support to three successful Falcon 9 launches and piloted the groundbreaking Global Positioning System III pathfinder satellite. Little, who acknowledged great honor in earning the award, said any accolades that come his way are a reflection on the team he is a part of, and the magnitude of the work they do. “The best part of our team’s job here at the Cape is hearing that the spacecraft we ushered through launch have been fully checked out and are entering operational life,” Little said. “That means we did everything right and gives us a huge sense of accomplishment. Building on that, we’ve gotten feedback from the users of these satellites about the impact they have on missions close to home and downrange,” Little said. He also emphasized how little room [meaning none] there is for error in his unit’s job performance. “One hundred percent mission success is our driver for how we manage our force. We have one shot at success in the launch mission and these satellites are crucial to the nation,” Little said with emphasis. He also said there is always room for improving his unit’s methods and processes. “We are always re-evaluating our mission execution after each launch to identify areas where we can improve or change processes to bolster mission assurance. We have to do this to be successful now and in the future,” he said. “Colonel Little led the squadron to a flawless performance in a year with the most demanding operations tempo in the squadron’s history,” wrote Brig. Gen. Nina Armagno, commander, 45th Space Wing, in a memorandum to Air Force Space Command Headquarters. “Sam also guided his team of young military engineers and experienced Noncommissioned Officers as they adapted to a dynamic schedule. He also leveraged his unrivaled space operations expertise and extraordinary leadership ability to make invaluable contributions to our nation’s space capabilities this year,” she wrote. The Department of Defense announced its electromagnetic spectrum strategy for sharing with the commercial wireless industry on February 20th—the electromagnetic spectrum is a range of frequencies of electromagnetic radiation and has many uses, including radio and satellite communications, radar, and GPS. The focus in sharing the spectrum is balancing the needs of the military and the needs of the commercial wireless industry, both of which have growing demand. “We cannot shift in a short time frame; we just have too much equipment and too much capability that really has to be transitioned in a very thoughtful way so as not to impose a major burden on budgets and a major burden on the taxpayers,” said Teri Takai, chief information officer for the Department of Defense. In the 1990s, 12,000 troops used an average of 90 megahertz of bandwidth. Now, 3,500 troops use more than three times that amount of bandwidth, on average. “The longer term spectrum needs for government agencies and industry alike can only be met through spectrum sharing. And we are looking for a top-to-bottom commitment from all stakeholders to make it happen,” said Nebbia. The Remote Tracking Station Block Change, or RBC antennas represent the latest telemetry, tracking and command technologies in the Air Force. The RBC antennas work as part of the Air Force Satellite Control Network, or AFSCN, of ground stations located around the world. These ground stations are vital to space operations because they allow satellite flyers in the Air Force’s space operations squadrons to communicate with the satellites they command and control. The effort to bring the RBC antennas fully online represents the first upgrade to remote tracking station antennas since Automated Remote Tracking Station 1 antennas were installed in 1987. The new antennas offer the AFSCN a non-keyhole environment, in other words, they can track an orbiting satellite during its entire pass over a tracking station. U.S. government contractors built and installed the RBC antennas at a cost of approximately $25 to $35 million at each site. The Air Force began installing RBC antennas at remote tracking sites back in 2004, when the first was constructed at Vandenberg Tracking Station. Following installation, antennas are tested and operated for a matter of time before Air Force Space Command leaders deem them ready for operational acceptance. Operational acceptance means the Air Force can take full advantage of a multitude of enhancements provided by the new antennas. They not only offer a better tracking range, they provide an 85 percent increase in redundancy and allow the AFSCN to perform in a more automated fashion. Bayless said the RBC antennas also should reduce, by up to 50 percent, the time tracking stations spend preparing for a satellite pass. Inmarsat has signed a contract with Hughes Network Systems, LLC ( Hughes ) to manufacture the new Low Profile BGAN terminal, which will equip police forces and other government departments around the world with a discreet communications terminal. Combining the proven reliability of Inmarsat’s globally available BGAN service with a lay-flat, rapidly deployable antenna, the new terminal delivers an innovative, remote capability that allows unmanned, concealed surveillance. “The development of Low Profile BGAN (LPB) grew out of the particular needs of our government customers and draws on the key strengths of our BGAN M2M service; reliability, global availability and the remote set-up , which allows for discreet and truly unattended connectivity,” said Peter Dingley, VP Offer Development, Inmarsat Global Government. Power and connectivity capabilities are key features in the government market. The Low Profile BGAN offers a viable solution to both of these hurdles when operating in remote areas and, in this regard, provides a unique product offering. “When you add to this the ability to be buried or camouflaged to avoid detection, the Low Profile BGAN is expected to become the staple SATCOM backbone of future discreet operations,” continued Peter Dingley. The LPB is a rapid-to-deploy, lay-flat, coverable, covert terminal, which allows the user to mount the device outdoors, on flat surfaces or buried under a layer of material, while maintaining high-speed data rate connectivity for applications including the streaming of real-time video, audio and data to a variety of end users throughout the world. 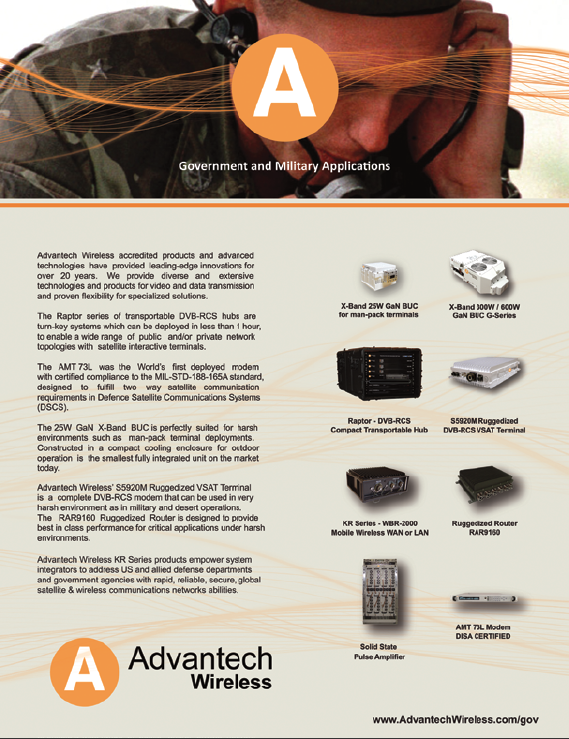 The solution is compatible with a wide range of currently available and future planned surveillance hardware. When fitted to these triggers, the LPB can lay dormant until awoken by a network command from the command center or triggered into action by an event in the field. The multi-phased array antenna negates the need for complex pointing and meets government-level environmental and ingress protection. The LPB is scheduled for end user testing later this year and the first 100 terminals are due for release from Quarter 3, 2014. Customer commitments have already been secured for a large portion of this first production run, with pre-production orders currently being taken for the remainder of the units. Expect a dynamic start to the Space Foundation’s 30th Space Symposium with featured speaker Gen. William L. Shelton, USAF, Commander, Air Force Space Command, opening the general program on May 19th. 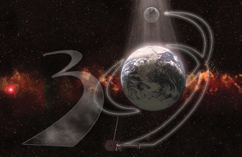 The 30th Space Symposium will be held May 19-22 at The Broadmoor Hotel, in Colorado Springs, Colorado, USA. The strong military content will continue as Gen. Shelton is followed on stage Tuesday morning by Brig. Gen. Jeffrey A. Farnsworth, USA, Deputy Commanding General for Operations, U.S. Army Space and Missile Defense Command (USASMDC)/Army Forces Strategic Command (ARSTRAT). As commander, Air Force Space Command, Peterson Air Force Base, Colorado, Gen. Shelton is responsible for organizing, equipping, training and maintaining mission-ready space and cyberspace forces and capabilities for North American Aerospace Defense Command, U.S. Strategic Command and other combatant commands around the world. Before assuming his current position, Gen. Shelton was the Assistant Vice Chief of Staff and Director, Air Staff, U.S. Air Force, Pentagon, Washington, D.C., and Chief of Warfighting Integration and Chief Information Officer, Office of the Secretary of the Air Force, the Pentagon, Washington, D.C.
A proud tradition at the Space Symposium is the annual Space Warfighters Luncheon, which celebrates the men and women who serve in the military around the world, with Lt. Gen. John W. “Jay” Raymond scheduled to speak at this event. 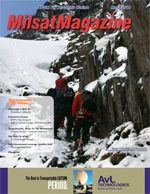 More at http://www.spacesymposium.org. 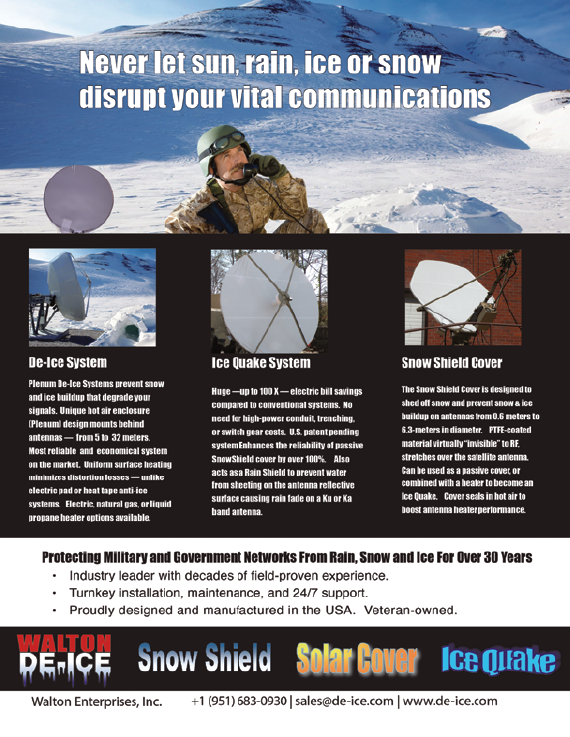 Teledyne Microwave Solutions (TMS) has unveiled three Ka-band Satcom-On-The-Move (SOTM) products that provide a unique value proposition for the most demanding SWaP needs of today’s commercial and military customers. Designed for ultra-lightweight applications such as Airborne and “ManPack” Portable Terminals, the Ka- SOTM Trio consists of a wide-band solid state power amplifier (SSPA), a Low Noise Block Downconverter (LNB), and a Block Upconverter (BUC). 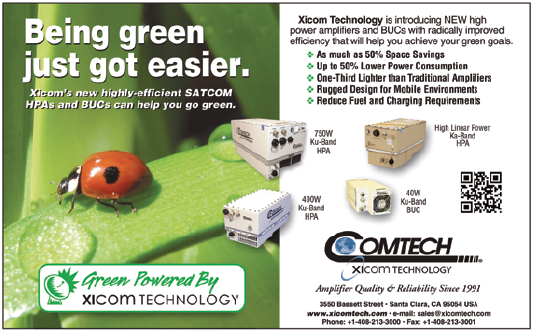 Both the LNB and BUC can be electronically switched between commercial and military Ka-bands. Leveraging TMS’ 40 years experience with ‘chip and wire’ technology, the three Ka SOTM products are hermetically-sealed for harsh environments and extremely power-efficient for battery-powered applications. Unlike much larger and heavier market alternatives, their miniature size enables close-proximity mounting on small antenna feeds for minimal loss or optical distortion. The Trio were designed specifically as a COTS suite of products not subject to ITAR regulations. The products were also designed with a modular approach that enables them to be deployed together as a fully integrated system, or independently giving customers new flexibility and options to maximize performance. Each multi-functional converter easily integrates into legacy and new systems, including either internal or external reference at both 10 and 50 MHz along with blanking and attenuation control. Combined with a standard TMS SSPA, a full transceiver can be configured to operate over the 29-31 transmit band and the 19.2 - 21.2GHz receive band with just three hermetically sealed modules. 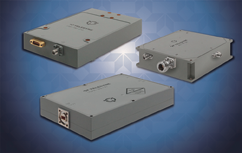 A standard TMS SSPA offers 16W P1 or 8W linear output power over the full 29-31 GHz frequency range. The unit also features extensive gain control and forward power monitoring. An internal BIT circuit monitors current, thermal and other critical parameters. TMS also offers a K-band (19.2 - 21.2 GHz) LNA with an industry leading 1.3 dB noise figure over the full 2 GHz bandwidth. With a total weight of 0.5 lbs. and an extremely small footprint, the unit is ideal for today’s integrated, light-weight Ka-band terminals.